As any cat owner knows, or even those that have ever been around cats, they’re quite a unique pet. Each cat has their own quirks, and it’s pretty safe to say that no cat is predictable. However, when it comes to their health, there are a few warning signs to look out for that will indicate that it’s time to bring your furry friend in to see one of our veterinarians in Tulsa. While we highly recommend annual exams for your cats, if you’ve noticed your cat displaying any of the following warning signs, then don’t hesitate to contact Southern Hills Veterinary Hospital today! While cats may be unpredictable goofballs, you know better than anyone what their typical behavior is like. Instinctually, cats hide their pain as a survival technique, so if something is wrong, they’ll likely avoid interaction with you as well as become lethargic and exhibit odd behavior that is different from their normal day-to-day demeanor. If your cat recently hasn’t acted like themselves, it’s better to be safe than sorry and take a trip to our animal hospital. 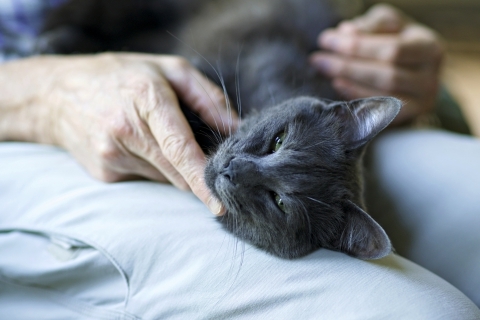 More often than not, a telltale sign that your cat is sick is if they stop eating their food. However, certain feline illnesses cause cats to eat more than they typically consume. So it’s important to keep an eye out on their daily eating habits. Also, kidney disease and diabetes can cause your pet to have an increase in thirst, so if they begin drinking more water than normal then you might have a sick kitty that needs to see the vet. If you own a cat, it’s likely that they’ve vomited at one point or another. Whether it’s the common hairball, they ate too fast, or they got a little bit over-excited, it’s normal for cats to throw up from time to time. Yet, if your cat is vomiting frequently, and especially if you’ve noticed blood in the contents, then you’re going to need to bring them to the vet immediately. Also, if they’ve been coughing for more than a day, it could be an indication of asthma and even heart or lung disease. While it may not be the most pleasant aspect of owning a cat, it’s important to keep an eye on their litter box and to check for any inconsistencies in their urine or stool. Diarrhea, blood, or if your cat is avoiding the litter box entirely, are signs that something is wrong and that they require professional animal care. If your cat is urinating more often than usual or shows signs of pain when going, they might be suffering from a urinary tract infection. In most cases, the cat will associate their pain with the litter box itself, so if they’ve been avoiding going to the bathroom, miss the cat litter, or begin going in other spots around the house, this is another call for help. The most important thing to remember as a cat owner is to trust your instincts. 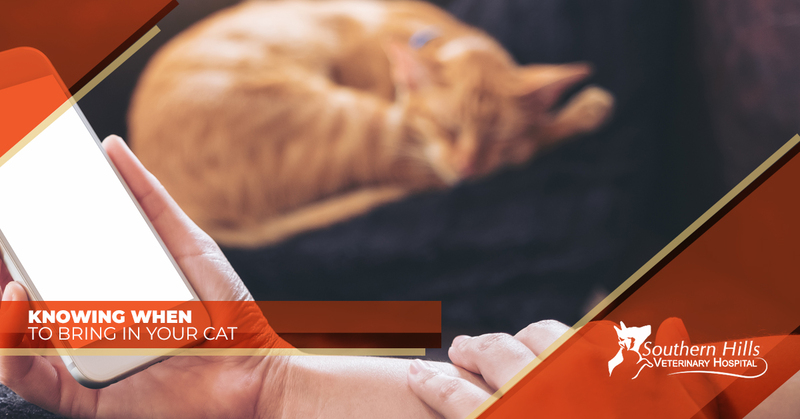 If you have a suspicion that something is wrong with your feline companion, even if it’s something minor, it’s always better to know for sure than to just ignore the situation. Even if you want to give us a call first and ask our professional opinion, don’t hesitate to do so! At Southern Hills Veterinary Hospital in Tulsa, we care about each and every animal that we see, and we want your cat to be in the best health possible and will do everything we can to ensure that they’re happy and healthy! If you’ve seen any of the signs that we discussed in this blog, or it’s time for their annual exam, then contact us today to schedule your appointment!